All our dust benches are made of a sturdy non vibrating metal structure carefully protected by ceramic and epoxy paint to ensure a long lifetime. The work surface is made up of impregnated timber planks. An impressive suction effect all over the perimeter of the XAGUA guides the stone dust effectively inside the machine, where it is captured by nebulized water drops. Metallic separators with lamellar structure inside the dust extraction bench slow down the speed of the turbulences. The muddy water particles first attach to them and then fall down into the internal tank. The continuous water overflow takes out the dirty water from the bench. 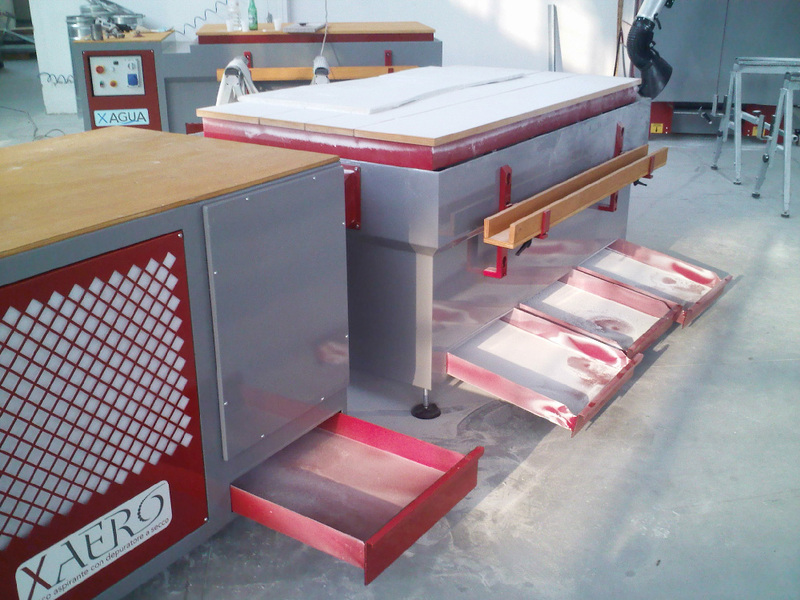 The innovation of the XAERO downdraft bench is the combination of two different dry operating dust extraction systems. Every time the Xaero air banker is switched off, a series of very strong compressed air blasts cleans automatically the filters. A cleaning cycle can be activated also manually at any time. WHAT WILL YOU LOVE IN THIS SUCTION BENCH? The very strong suction power of the dust extraction bench XAERO is equally distributed all over the work surface and its perimeter. Additionally, it is possible to lift two planks of the wooden surface to capture effectively all the dust produced by disc cutting. Easily accessible drawers collect the dust which is suppressed by the cyclones and the filters and allow to do maintenance in a few minutes without polluting the environment. The engine compartment is sound proof. The suction unit can be separated from the work bench and can be placed in an adjacent room or outside, thus gaining more space in the work shop.